Richard originally started at ESC on the Kick Start programme. 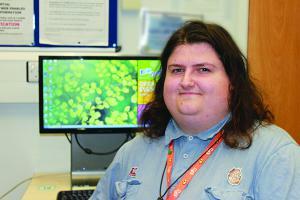 He progressed on to Business Admin and then IT Level 2 before his current course. He developed a passion for IT and his tutors helped him select the right course for him. Richard’s favourite area is animation however he enjoys the variety of subjects included in his course. Richard had the opportunity to work in a local hospice as part of his work experience and was able to see how the charity functions as a business. The experience helped him observe first hand how real businesses work and gave him the opportunity to interact with people in a real world situation. Richard aspires to teach either Business or IT in a further education college and is progressing on to the Internet Software Development Foundation Degree (FdSc) at ESC.